Many air switches are used to control various functions equipment, such as garbage disposals. The garbage disposal switch has an pneumatic push button located on the counter top or wall mounted, and a pneumatic air switch located in an electric to pneumatic converter box functioning the garbage disposal. The converter box directly connects to a 120V power supply to control the garbage disposal operation. 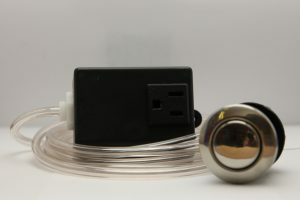 A piece of flexible PVC tubing leads from the push button to the garbage disposal switch. This pneumatic control is a safe switching mechanism as it eliminates the possibly of user’s experiencing electrical shock, as there is no electricity at the point of actuation. More times than many, when customers call Presair, we are able to help them find a solution to why the air switch in a garbage disposal isn’t working. Here are a few things you can try before contacting us! Typically the operator is finding a kink or leak in the airline that is not allowing air to pass to the air switch to open or close the contacts. This is easily fixed by either replacing the tubing or relocating it. Sometimes the issue is found with the push button or the switch. To determine where the failure is happening, first the operator can press on the air button assembly and listen for a ‘click’ sound in the air switch. If the ‘click’ happens, then the push button is sending enough air to trigger the air switch. If no click is heard, the air switch isn’t sensing air pressure therefore the issue lies with the air tubing or push button. Although, if the switch doesn’t click, but makes a hissing sound like air is leaking from the air switch, then unfortunately the air switch diaphragm has blown and a new switch is necessary. Determine the type of garbage disposal switch for the suspect by looking up the identification number or by contacting Presair. Now, what if the air switch is clicking, but still nothing is happening? Verify the correct operation of the garbge disposal switch circuit. Connect the multimeter to a set of power leg/switch leg poles. Since there are only two poles on a SPST air switch, make the connection to each pole. Operate the air button. The multimeter should, alternately, show continuity and no continuity, as the air button is operated. If the the multimeter does not show continuity of the switch, replace the garbage disposal switch. 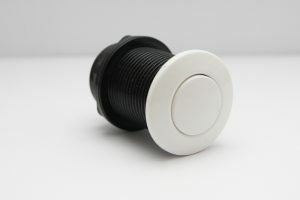 For more information about the Presair garbage disposal switch or to purchase one, visit one of the links below.